Karjat is one of the favourite destinations for trekkers. This is a central location for trekkers to visit places like Rajmachi, Peth, Songir, Peb, Irshalgad, Bhivgad, Dhak and Bhimashankar. Sondai, a relatively less known popular fort is also within reach. This fort is a part of the Matheran range. Though it does not have any structural remnants, the scenic views it offers and the final 15ft of rock patch makes it a thrilling experience. This fort was supposedly built as a watch Tower. Sondewadi and Vavarle are the base villages of Sondai fort. Sondewadi village is situated at 1/4th height of this fort. The pathway from this village goes to the fort which takes 15-20 minutes to reach to the plateau. Here we can see the route coming from Vavarle village. From here we can see 2 flag posts at the top of the fort (from one of this flag post, i.e. at the cliff of rock patch, one can reach to the top with the help of ladder which is kept there). Further there is carved steps in rock. 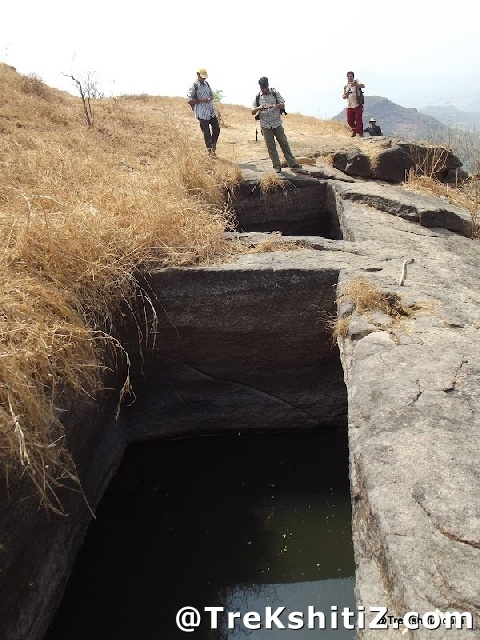 From Sondewadi, it takes 45mins to reach the second plateau. Here exist the two adjoined cisterns which are carved in rock and hold water all year round. But in summer the water level falls and we can pull out water using rope. From here we can see neighboring Gavari hill which seems taller than this fort. At the upward side of the plateau carved steps are there. After climbing them, at the left side we can see the dried cistern while at the right side, there has a ladder to ascend. We should remove our footwear here and move forward to the summit. (This is a sacred place dedicated to Sondai Devi and it is recommended to respect the beliefs of the locals). There are footholds as well a ladder to climb to the summit. After climbing this rock patch, at the right side there are two cisterns, in which one is a big with two rock pillars in it and its water is not potable. Second cistern is small compare to the first one. There is not much place to move around at the top of the fort. Here we can see two-three carved idols which are placed under the tree. One of it is Sondai Devi�s idol/statue. From the top we can see the Matheran Mountain Range, Morbe Dam, Vavarle Dam and nearby surroundings. There are 2 routes to reach to the Sondai fort. Alighting at the Karjat station, walk towards the Kalyan end and come out to the East side. By taking 6 seater auto or S.T from Karjat-Chowk for around 4km we can reach to the Vavarle village�s Phata, where we can see the arch at the entrance of the village. The route under the arch entrance leads to Vavarle dam which comes down from the Vavarle village. It takes half an hour to reach here. The pathway at the right side of the dam�s wall goes to the Vavarle Thakarwadi. After crossing the hillock in Thakarwadi and coming down from the hill, we have to cross a stream. It takes almost 15 minutes from here to reach to the plateau. Here we meet the trail from Sondewadi. From here the way to reach to the fort is well described above. One can avoid this route after November-December and take the other way along the direction of stream flow. This will save the time by not making us to climb and get down the Thakarwadi hill. It takes 2-3 hours to climb the fort from this route(Vavarle village).The route goes from the Vavarle village is more tiresome and tough than the route of Sondewadi village, and also takes more time to summit. One, who is having their own vehicle, can come to Chowk from Mumbai-Panvel highway. On Karjat-Chowk road, Borgaon phata is of 6kms while Vavarle Phata is of 9kms. Alighting at the Karjat station, walk towards the Kalyan end and come out to the East side. By taking auto from here we can reach to the Sondewadi village which is about 9 km. Or take 6 seater auto or ST from Karjat Chowk and alight at the Borgaon Phata. A walk of 3km on the road along Morbe Dam takes us towards the Sondewadi village. The route from Sondewadi to the Sondai fort described above. It takes around 1 to 1.5 hour to climb the fort from this route. No accommodation facility on the fort, but the arrangements can be done in the schools of Vavarle Thakarwadi and Sondewadi by asking the villagers. Food arrangements have to be made by our own or in Karjat village. Cisterns on the fort are a source of drinking water all year round. 1. In rainy seasons, don�t rely on the carved sockets or the ladder. Carry your own rope (at least 30 ft.) for more safety. 2. In summer, carry your own rope to pull out the water as the water level of these cisterns goes down. 3. To climb up use the Sondewadi route and to climb down use the Vavarle route. This is because from the top of the fort Vavarle village and surroundings can be easily seen so there are fewer chances to stray.